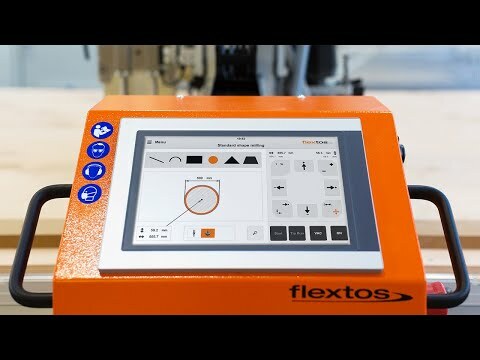 As an absolute novelty on the market, the flextos Hybrid CNC is the very first milling and sawing table to 100% fulfil the ever-increasing demands on quality, design, and efficiency in drywall construction. Layout and design of the machine are based on the proven concept of the flextos Supercut series. In addition to the customarily simple and dust-free processing of different board/panel materials, a number of other technical innovations have been added: with its specially developed software, the flextos Hybrid CNC may be controlled via a user-friendly user interface (intuitive touch panel) – without any previous CNC programming knowledge – or the import of CNC programs via USB stick. A unique feature of our Hybrid CNC is its sequence control mechanism, for the production of individual mouldings – with this feature a wide range of dimensions may be produced in series. With its intuitively operable software, there are almost no limits to drywall construction design options. The Hybrid CNC teach-in function allows for the creation of programs by marking a shape or points on a board/panel, and saving these individually – comparable to "painting by numbers". All boards/panels made of mineral fiber and gypsum-based materials (such as gypsum plasterboard), wood composite materials, plastics, Alucobond, etc.